The debate over gun regulations was hard-fought over several days. Supporters of the proposal by Sen. Laura Ebke of Crete wanted a uniform, statewide law that would preempt stricter local ordinances, like those in Lincoln and Omaha. Opponents of the bill said cities should be able to enact regulations that were stricter than state law, to take account of local circumstances. 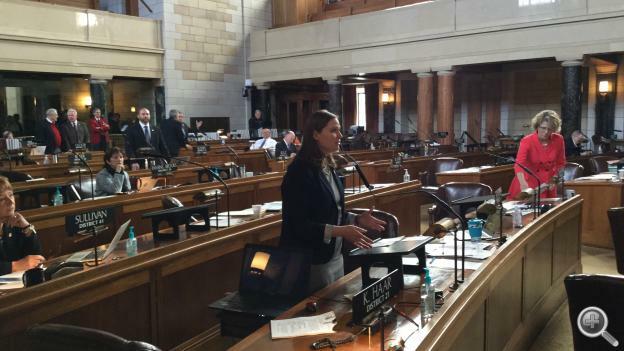 Sen. Kate Bolz of Lincoln gave examples of reasons why she objected to the bill. “The bill as written would remove existing local protections for domestic violence shelters and drug rehabilitation centers, and would remove current provisions that prohibit individuals convicted of stalking and sexual assault from possessing weapons,” Bolz said. On the other side, Sen. Ken Schilz of Ogallala asked Ebke about a restriction in Omaha, which requires registration of handguns, that Schilz suggested was unconstitutional. “A lot of these people that are coming in and registering guns that were turned down for the registration were turned down for possession of marijuana less than an ounce. Is that correct?” he asked. “That’s what we were told by the Omaha Police Department,” Ebke replied. Opponents and supporters of the bill were unable to reach a compromise. So the issue came down to whether supporters had the 33 votes necessary to break a filibuster by opponents and vote on advancing the bill. They came up one vote short, at 32, which means the bill will not be considered again this year. Following the defeat, Sen. Bill Kintner of Papillion predicted the issue would come up again in future years. “You know what? This isn’t over. We will continue to fight for your gun rights. We will fight for our constitution. And I’m very pleased that we didn’t win this one, but we’re going to live to fight another day,” Kintner said. Also on Wednesday, senators took up a bill that would strengthen a statewide registry of drug prescriptions, in an attempt to combat prescription drug abuse. Sen. Sara Howard of Omaha, whose sister died of a prescription drug overdose in 2009, said current state laws on the subject are weak. “One of the challenges in Nebraska is that we don’t have a functioning prescription drug monitoring program. We have documented cases from different people from at least 38 states coming to our state to fill prescriptions for narcotic pain medication. Three hundred of those people came from Florida alone after they tightened their prescription drug monitoring program,” Howard said. “Nebraska currently has a rate of 79 painkiller prescriptions per 100 people That’s enormous,” she added. Howard’s bill would strengthen Nebraska law by no longer allowing people who are prescribed medicine to opt out of being entered on the registry. It would also eliminate an exemption for prescriptions that are paid for in cash. Several senators who spoke in favor of the bill said they had family members who suffered from opioid addiction. And Sen. John Kuehn of Heartwell said the problem is not restricted to the state’s cities. “The issue of opioid diversion – drug seeking behavior – in our rural communities is just as significant if not greater than in some of our urban communities,” Kuehn said. Under the bill, physicians would be able to access the registry free of charge. The costs of the system over the first four years would be paid from $1.25 million in federal grants. After that, there could be licensing fee increases for doctors and others who write prescriptions, and pharmacists who fill them. But that is yet to be decided. Following debate, the bill got the first of three approvals it would require on a vote of 47-0.